Found a producer which claims magic iso 15693 tags, the initial tags has all same UID which is a good indicator that the claims are true. I will pump it the details this week. Let's see who is interested. The tags has a custom uid set, when ordered from supplier. So yeah, work, but not very useful in current version. The supplier doesn't want to release how to change UID at will,.. This will limit their sales quite a lot. "The only certain thing, the insecurity of things"
Ask for uid changeable iso-15693 cards. aka magic. Not custom UID... possibility to change uid by yourself. My contact can supply me ISO15693 tags with UID modifiable. I have asked him to send me some samples, as soon as he receives them, I will contact you. Who is your chinese supplier? I really do not know who is the Chinese manufacturer, I always do business with him as an intermediary. I met him in a congress through a provider. I do not know if he will be a reseller, I call him "the obtainer", because practically everything I have asked for and they are not usual things that you can find on aliexpress or GeZhi Electronic Co.Ltd. at the end, he has obtained them to me, and he makes me personalized works. I think that either I misread your message or you misunderstood me ... GeZhi is not my contact, he is a Chinese who lives in Valencia (Spain). I do not think it has anything to do with GeZhi. you are right, I missunderstood. The ISO15693 uid-custom card found on RFXSecure https://www.rfxsecure.com/product/icode … tom-inlay/ has now been sorted out to become fully UID rewritable. Did the samples I sent you work? Why card select failed (and write/read is OK)? that would be more of iso15 support in firmware than the magic tags fault. Try the offical repo, it has gotten some major changes the last months when it come to iso15, to see if it works better for you. I also experienced that, so i used the R option with 10 times and finaly got my dumped. For this i played a little with the antenna and the card, to find the right position.. The ISO15693 uid-custom card found on RFXSecure has now been sorted out to become fully UID rewritable. 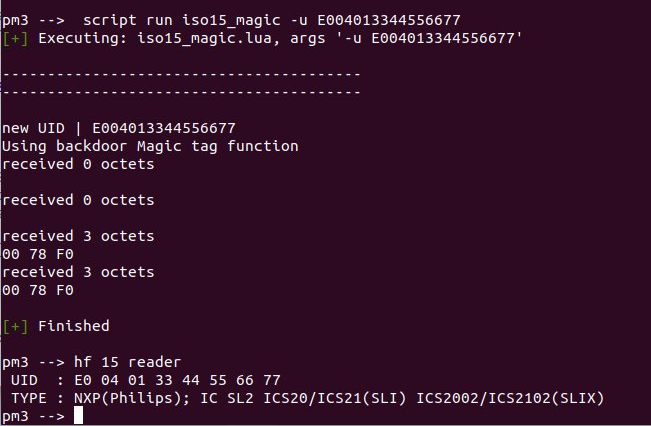 I have searched for the iso15_magic script for a while now. Would it be possible to get it into my fingers? BTW: Its absolutely true that the iso15 cards are picky regarding distance to the antenna. I am using a soldering claw to fix the distance between card and antenna which significantly improves the selec/read/write operations. Depends where you bought your cards. If you bought from rfxsecure.com https://www.rfxsecure.com/product/icode … tom-inlay/ you should have gotten it from them. I bought recently a lot of ISO 15693 magic stickers from this manufacturer. But anyway I would love to interface those by proxmark. Especially since the manufacturer want quite outrageous sum for the software to write UID ($1000 for every type of the card and HWID locked for 1 PC only). In case it's something different I actually bought the software for the client (only for I-Code SLI-X.....they want another $1000 for the icode SLI-S) so I could record/sniff the command for the UID rewrite. But since I'm unskilled with Proxmark, can You help me with that? 1) I need the Icemans lua script to try the same UID operations as mentioned above (But 50/50 since they use a different commands for SLI-X and SLI-S). 2) I need the re-commanded commands and setup for proxmark to sniff the UID write from OEM software. Re 2) iso15693 allows a variety of modulations and codings. Proxmark knows only some of them. But give it a try: 'hf 15 snoop', stop with PM3 button, then 'hf list 15’.